The network of electric vehicle advocates to support electric vehicles in North Carolina is growing and becoming more interconnected! The Southern Alliance for Clean Energy recently became a member of Plug-in NC and advocates are working to get a specialty license plate that would support electric vehicles. 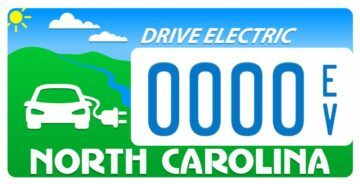 Electric vehicle drivers and advocates in North Carolina are working to get a special license plate in support of EVs.The DMV and General Assembly will consider adopting the new plate if 500 (paid in advance) applications are received by February 8, 2019! The application must be snail mailed to Advanced Energy who is coordinating the process. If it doesn’t pass the approval process, all application money will be refunded. Click here for the application and instructions. And FYI, the plate can be displayed on ALL vehicles, not just EVs. Plug-in NC has been working in North Carolina since 2011 to establish the state as a leader in electrified transportation. The state-wide program promotes electric vehicles through education and outreach, consulting and resource development. Plug-in NC was started by the North Carolina Plug-in Electric Vehicle Taskforce to track electric vehicle efforts across the state and raise awareness of driving electric. The Southern Alliance for Clean Energy is proud to be a member of Plug-in NC and to join this movement to encourage electric vehicle adoption. To support EV adoption throughout our region, SACE also has installed a solar-powered EV charger at our Asheville office. So whether you are an Asheville resident commuting around town, or are a traveler passing through, we invite you to visit our solar-powered charging station, conveniently located right off of Interstate 240 in downtown Asheville. If you would like to charge with us, here’s a link to get started. NC EV Drivers & Enthusiasts are in Good Company! The Tar Heel state is home to more than ten thousand plug-in hybrid and all-electric vehicles, and there are over 600 charging stations statewide. North Carolina is also home to three federally-designated Clean Cities Coalitions: The Land of Sky Coalition in the west, Centralina Coalition near Charlotte, and Triangle Clean Cities Coalition near Raleigh-Durham – these all work to create networks of local stakeholders and in part provide technical assistance to fleets implementing alternative and renewable fuels. 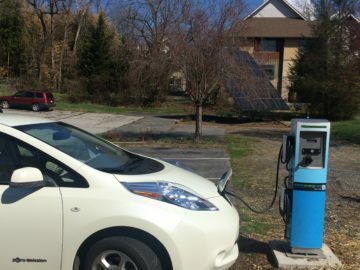 The state also boasts the Blue Ridge EV Club, which is a group of EV drivers and EV enthusiasts, who are “interested in promoting the benefits and joy of driving plug-in electric vehicles.” The network of electric vehicle advocates to support electric vehicles is growing and becoming more interconnected! The Southern Alliance for Clean Energy enthusiastically supports the rapid decarbonization of our transportation system, which has become the biggest contributor to greenhouse gas emissions in the U.S. Electrifying our transportation sector with the increased use of renewable energy and advancing electric vehicles will bolster our economy, save consumers money, and reduce our dependence on oil and the threats from offshore drilling. Check out SACE’s Electrify the South website and visit cleanenergy.org to learn more about our efforts and find out how you can get involved. You can also sign up here to get updates about electric vehicles delivered to your inbox, and make sure to follow us on Facebook and Twitter.